...Does the tornado look like it's coming this way? OK, that tornado really looks to be headed right for us. A tornado is a violently rotating column of air, regarded to be the windiest phenomenon on the Earth (besides Bill O'Reilly). They are also referred to as twisters, cyclones, or even hell carousels. Tornadoes come in many shapes and sizes including large funnels, huge cones, gigantic triangles, and big upside-down pyramids. Most have wind speeds less than 110 miles per hour and are 250 feet across or less, although some have been known to reach speeds and proportions great enough to threaten A-list celebrities such as Helen Hunt and Bill Paxton. Waterspouts are regarded by some meteorologists to be true tornadoes, while other meteorologists absolutely do not consider them to be tornadoes, thank you very much. Other cyclone-like phenomena that exist in nature include dust devils, whirly-birds, landspouts, fire whirls, swirling lava conflagrations, soul-consuming maelstroms, and that little updraft that carries a plastic bag way in the air. The popular board game Twister is based on the intertwined contortions seen among the wreckage in tornado-damaged areas. Tornadoes have been witnessed on every continent except Antarctica, which is why penguins remain the only true flightless bird. The vast majority of cyclones occur in the "Tornado Alley" region of the midwestern United States. This area is sparsely populated, mostly as a result of the population being blown away by recurring intense winds. 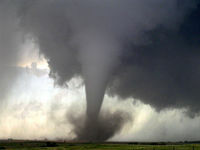 There are many methods of ranking tornado strength; one of the most widely used is the Fujita scale. This scale originated in 1971 when a particularly violent tornado picked up and threw a heavyset Japanese-American man by the name of Hank Fujita. By the time Fujita landed, he had traveled over 2 miles. Miraculously he survived, and meteorologists began ranking cyclone strength in terms of the distance a tornado could toss Hank Fujita. A small storm could achieve a Fujita distance of one mile (an F1), while the strongest recorded twisters are thought to be capable of hurling Fujita over 5 miles (an F5). The word tornado originates from the Spanish word tronada, which (like the vast majority of words in the Spanish language) refers to a dish of meat and cheese wrapped in a corn tortilla. This in turn was taken from the Latin Tonare, referring to a gladiator from the time of the Holy Roman Empire who was famous for spinning in circles after victory in battle. While both of these terms are similar to the word in their respective languages for "to turn", etymology experts consider this connection to be wishful thinking, and prefer the tenuous links to spinning presented earlier in this article (see Etymology section). Tornadoes are thought to be a weather phenomenon that existed well before the invention of the camera, although this claim is not backed by photographic evidence. The American Dust Bowl was a single extremely weak tornado that covered the entire Midwestern United States from April 1934 through September 1937. Due to the ongoing depression, farmers in the area were not able to take preventative measures from this tornado, and all of their crops were blown away very slowly. Tornadoes were exclusively black and white in appearance before the 1939 film The Wizard of Oz, in which a twister relocates a simple Kansas girl to a colorful land of jaundiced little people and expensive, jeweled footwear. Attempts at an early warning system for tornadoes began in the 1950s. Before this, the most advanced notice that one could hope to receive regarding an impending twister was reading about it in the newspaper the following day. With the advent of radar, this was improved significantly. Blazing klaxons installed on every streetcorner, previously only used to warn citizens of impending nuclear strikes, could now be used to alert residents of their impending windy death. Today, tornado activity is monitored by a network of professional storm chasers who make a living out of hunting tornadoes and selling weather information to lazy television weather forecasters. These tornado hunters have the second highest fatality rate of any occupation, trailing only professional ostrich polo players. Tornadoes are the ninjas of the natural world - they can strike without warning, giving no time for preparedness or preventative measures. However, there are preventative measures that can be practiced to increase preparedness. Having a plan for dealing with a cyclone is shown to increase survival odds. These plans can include moving towards the center part of one's home, seeking shelter in a basement or root cellar, and immediately ceasing all knife-juggling activity. Weather advisories in the form of harsh tones on radio and television have also proven to be effective at interrupting football matches. A tornado is a column of air moving rapidly in a circular fashion extending from the ground up to the base of the cloud deck. Invisible tornadoes, able to occur when no clouds are present, are terrifying and will not be discussed in this article. There is no formally recognized definition for a tornado, as tornadologists arguing over the tornado-ness of a particular cyclone often have trouble hearing each other over the loud winds. Areas of intense low pressure caused by high wind speeds (as described by Bernoulli's principle), rapid rotation (due to cyclostrophic balance), and magic results in the formation of a visible funnel cloud. Occasionally, a single storm will produce multiple tornadoes. This is known as a 'tornado outbreak' and can be treated with a large prescription topical cream applied over the affected outbreak area. Tornadoes with nearly cylindrical profiles and relatively low height are known as "stovepipe tornadoes" due to a folktale involving Abraham Lincoln once wearing a tornado as a hat. The largest and deadliest tornado in history was the Tri-State Tornado of 1925, which ravaged two states in 1922. As a result of this twister, Oklahoma was blown over fifty miles to the north, forming its distinctive panhandle shape. The fastest winds ever recorded in a tornado were 301 mph (482 km/h). Over five hundred tornadoes are tied at this exact wind speed, since it is the highest velocity measurable by a wind speed meter before it catastrophically fails. The most extensive tornado outbreak occurred in the 1993 made-for-TV movie Twisters, Twisters Everywhere, when over seventy thousand tornadoes struck the almost uninhabited town of Bumspoon, Nebraska in a single storm. The most extensive tornado outbreak in real life was the April 2011 outbreak in the southeastern US. The most commercially successful tornado is thought to be the Tasmanian Devil. This page was last edited on 9 June 2015, at 02:53.